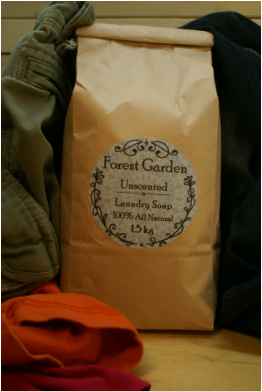 Our all natural, eco-friendly, handmade laundry soap is free of fillers, perfumes, and other artificial ingredients. It works well in high efficiency and standard washing machines, and can be used with cold or hot water. Because it does not contain any perfumes, our laundry soap will not scent your clothes, but will leave them smelling amazingly clean and fresh. One Tablespoon is all you need for a regular load (two tablespoons for large loads, extra dirty, or smelly laundry). Each 1.5 kg bag contains enough soap to wash approximately 100 loads of laundry.